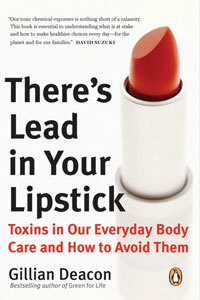 Each morning we spritz, soak, and slather ourselves in 127 different chemicals, many of which are toxic. Each time we draw a bubble bath for a child, lather foaming cream for a shave, or deodorize our underarms, we expose our bodies to innumerable chemicals with limited research on their long-term health effects. The cosmetics industry is not required to prove an ingredient is safe for human health before it is used in a consumer product. Shocking, but true. As a breast cancer survivor, Gill Deacon takes the issue of toxins in bodycare products to heart. Her book is a friendly, informative and meticulously researched guide to more considered options for personal care, showing how to navigate misleading labels and greenwash, and ultimately arrive at safer choices, for a healthier family and a healthier world. Download Gill's Handy Wallet Sheet here. "Gill Deacon's There's Lead in Your Lipstick is a wake up call for women of all ages to look beneath the gloss of the beauty industry. Essential reading." I love this book! Thank you to Gillian Deacon for your bravery in writing such an honest and comprehensive book about what we all need to know about the products we put on our bodies. STACY MALKAN, co-founder Campaign for Safe Cosmetics, and author "Not Just a Pretty Face: The Ugly Side of the Beauty Industry"
© COPYRIGHT GILL DEACON. ALL RIGHTS RESERVED.